With the Old Breed: At Peleliu and Okinawa is a World War II memoir by Eugene Sledge, a United States Marine. 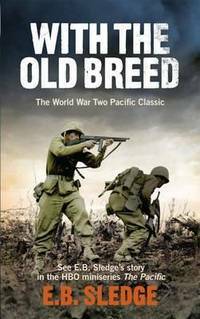 Since its first publication in 1981, With the Old Breed has been recognized as one of the better first-hand accounts of combat in the Pacific during World War II. The memoir is based on notes Sledge kept tucked away in a pocket-sized Bible he carried with him during battles. Novato, CA: Presidio Press. VG/VG-; Hardback in Very Good condition with Very Good- dust jacket.. 1981. Hardcover. 8vo 8" - 9" tall; 326 pages; Original edition. Signed by E. B. Sledge on front endpaper. Ink ownership inscription on front endpaper. Stain to interior of dust jacket; moderate wear to dust jacket edges. ; Signed by Author . Condition: VG/VG-; Hardback in Very Good condition with Very Good- dust jacket. Bt Bound, 1990-09. Hardcover. Good. 1996-04-01. Good. Ships with Tracking Number! INTERNATIONAL WORLDWIDE Shipping available. May not contain Access Codes or Supplements. May be ex-library. Shipping & Handling by region. Buy with confidence, excellent customer service! Naval Inst Pr. Hardcover. 1557507473 New Inside and Outside. Clean and crisp! Some small scribbling on first page. You will be pleased. Excellent book! ( z1s54C ) Some very minor shelf wear on cover. ** Fast Shipping! ** . New. Novato, CA: Presidio. Very Good in Very Good dust jacket. 1981. Book Club Edition. Hardcover. Two closed tears to dust jacket, one from bottom of spine - up, it is internally tape repaired, the other is to upper right of back panel. ; Illus. , maps ; 330 pages . Naval Inst Pr. Hardcover. 1557507473 New Condition. . New. Naval Inst Pr. Hardcover. 1557507473 Like New Condition. . Fine. Ebury. PAPERBACK. 0091937523 Brand new book.Buy with confidence. Money Back Guarantee.Expedite Shipping Available. International shipment available. . New. 1990-06-01. New. Ships with Tracking Number! INTERNATIONAL WORLDWIDE Shipping available. Buy with confidence, excellent customer service! 2007-08-05. New. Ships with Tracking Number! INTERNATIONAL WORLDWIDE Shipping available. Buy with confidence, excellent customer service! 2007-07-07. New. Ships with Tracking Number! INTERNATIONAL WORLDWIDE Shipping available. Buy with confidence, excellent customer service! Presidio Press. Used - Very Good. Very Good condition. Very Good dust jacket. Book Club edition. 1990-02-08. Good. Ships with Tracking Number! INTERNATIONAL WORLDWIDE Shipping available. May not contain Access Codes or Supplements. May be ex-library. Shipping & Handling by region. Buy with confidence, excellent customer service! 2010-02-01. Good. Ships with Tracking Number! INTERNATIONAL WORLDWIDE Shipping available. May not contain Access Codes or Supplements. May be ex-library. Shipping & Handling by region. Buy with confidence, excellent customer service! Oxford University Press. PAPERBACK. 0195067142 New Condition. . New. Ebury. PAPERBACK. 0091937531 New Condition. . New. 1990-06-01. Good. Ships with Tracking Number! INTERNATIONAL WORLDWIDE Shipping available. May not contain Access Codes or Supplements. May be ex-library. Shipping & Handling by region. Buy with confidence, excellent customer service! Naval Institute Press, 1996. Hardcover. Very Good. Disclaimer:A copy that has been read, but remains in excellent condition. Pages are intact and are not marred by notes or highlighting, but may contain a neat previous owner name. The spine remains undamaged. At ThriftBooks, our motto is: Read More, Spend Less.Dust jacket quality is not guaranteed. 2007-08-05. Good. Ships with Tracking Number! INTERNATIONAL WORLDWIDE Shipping available. May not contain Access Codes or Supplements. May be ex-library. Shipping & Handling by region. Buy with confidence, excellent customer service! 2007-07-07. Good. Ships with Tracking Number! INTERNATIONAL WORLDWIDE Shipping available. May not contain Access Codes or Supplements. May be ex-library. Shipping & Handling by region. Buy with confidence, excellent customer service! Presidio Press. Paperback. 0891419063 Please allow 4 - 14 business days for Standard shipping, within the US. Thank you for supporting our small, family-owned business! . New. 2007-05-01. 1st. Presidio Press. Paperback. 0891419063 Please allow 4 - 14 business days for Standard shipping, within the US. Thank you for supporting our small, family-owned business! . Fine. 2007-05-01. 1st. BALLANTINE. New. 8.23 x 5.54 cm. Oxford University Press. PAPERBACK. 0195067142 Like New Condition. . Fine. Presidio Press. Paperback. 0891419063 Please allow 4 - 14 business days for Standard shipping, within the US. Thank you for supporting our small, family-owned business! . Fair. 2007-05-01. 1st. Presidio Press. PAPERBACK. 0891419063 Remainder mark . Fine. Presidio Press. PAPERBACK. 0891419063 Minor shelf wear . Very Good. PRESIDIO. New. 6.92 x 4.34 cm. Presidio Press. PAPERBACK. 0891419063 Special order direct from the distributor . New. Ebury. Used - Good. Good condition. Ebury. PAPERBACK. 0091937523 Brand New ,Original Book , Direct from Source , Express 5-8 Business days worldwide Delivery. . New. Presidio Press, 2007-05-01. Paperback. UsedVeryGood. paperback. Cover has edge wear and slightly curled corners. Presidio Press, 2007-05-01. Paperback. Used:Good. Presidio Press. PAPERBACK. B00FY5LGIQ . New. Presidio Press. PAPERBACK. 0891419063 signs of little wear on the cover. . Very Good. Presidio Pr. Reprint. Politics & History. New. Brand New: This item is brand new unopened, never used and still in its original manufacturer condition. Oxford University Press, USA, October 1990. Trade . 4.1 PB extra nice +5%. Presidio Press. PAPERBACK. 0891419063 *LIKE NEW* Ships Same Day or Next! . Fine. Presidio Press. PAPERBACK. 0891419063 *BRAND NEW* Ships Same Day or Next! . New. Presidio Press, 2007-09-25. Reprint. Mass Market Paperback. Used:Good. Presidio Press. PAPERBACK. 0891419063 . New. Presidio Press. Paperback. 0891419063 . New. 2007-05-01. 1st.